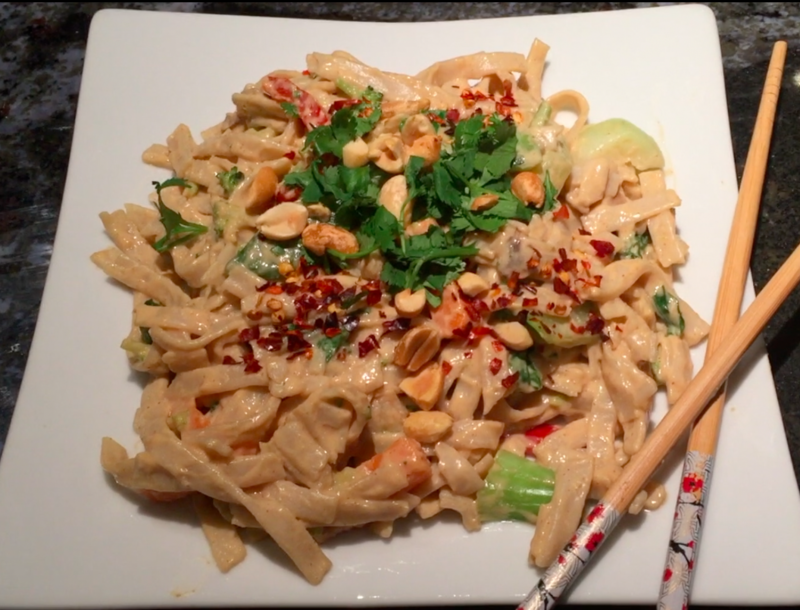 Who doesn’t love Peanuty Pad Thai Noodles? Well, I’m sure plenty of people don’t love them…but I haven’t met them yet. These noodles really are one of my favorite go-to plant based dishes that please the palates of omnivores, vegetarians and vegans too. This version of Pad Thai is amped up with calcium packed bok choy and ready-in-a-snap frozen mixed vegetables. 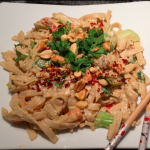 I love to use a fiber and iron rich brown rice pasta and my very versatile and yummy Asian Peanut Sauce. The dish comes together so quickly, it feels like cooking for cheaters. But hey..there is nothing at all wrong with shortcuts in the kitchen. In fact, I’m all about finding ways to pack our bellies full of the most healthy foods on the planet: grains, beans, fruits, vegetables, nuts and seeds. Just like you, I don’t want to spend hours in the kitchen for the sake of delicious food. That’s why this recipe is such a hit in my books and perhaps it will be in yours too. Here are the ingredients for the recipe. It follows my 5-step Healthy Vegan Made Easy system for eating an abundance of health promoting foods. And here it is plated and garnished. In a medium sized pot, boil the pad thai noodles according to the package instructions. Drain and rinse. Heat a large wok or saucepan over high heat. Add ¼ cup of water and the frozen vegetables. Heat for 2 minutes. Add the chopped bok choy to the pan and continue cooking on high heat for another 2-3 minutes until the vegetables are crisp and tender, adding more water if necessary. Reduce heat to medium high and add the peanut sauce, coconut milk and sriracha to the pan. Stir to combine and continue stirring for a minute or so until the sauce is heated through. Add the peanut noodles and stir until well covered with the sauce. Season with salt to taste. 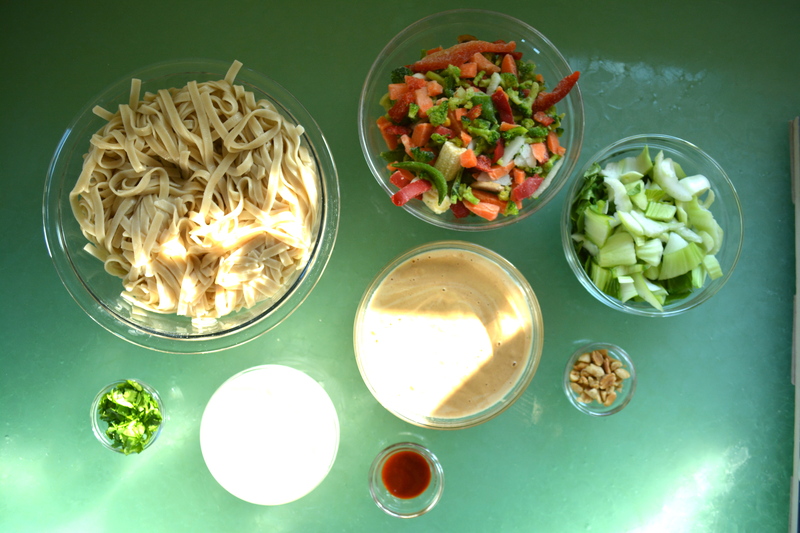 Serve garnished with chopped peanuts, chopped cilantro and bean sprouts if desired.